Stella York 6758: Making her royal entrance today is Miss Stella York with Style 6758! Featuring a plunging neckline and square open back, this princess wedding gown boasts the modern trends you love with the classic bridal elements of your dreams. The to-die-for ballgown skirt is dramatic yet elegant, with fabric-covered buttons running the course of the simple train—and of course, some added pockets for a touch of bridal magic. Stella York: 6391 This romantic lace wedding dress with cap sleeves and cameo back from Stella York is a sweet reminder of feminine style. Romantic, matte lace adorns the bodice of this sweet gown and creates a shadow effect throughout the tulle skirt, bringing dramatic volume and subtle interest to this A-line wedding dress. The flattering waist is drawn in by a crystal belt and deep sweetheart neckline that is finished by swirls of organic edge lace – for a truly unique dress! Highlighted with a unique, cameo lace design the back of this lace wedding dress is just as dreamy as the front! Fabric buttons over an easy-to-close zipper allow the butterfly lace motif to shine. This gorgeous lace wedding gown is available in sizes 2-34. Stella York 6718. Feel like the belle of the ball in this vintage satin wedding dress by designer Stella York. This new dove satin wedding gown has a romantic sensibility that can’t be beat. Lovely off-the-shoulder straps extend from the neckline of this gown and drape elegantly down the bride’s arms and can be detached to create a unique look from ceremony to reception. The gown’s easy-to-wear shape with a sweetheart neckline and natural waist are flattering on any figure. This wedding dress also features on-trend pockets that can be easily accessorized with a veil. Affordable and chic, this vintage satin wedding dress is available in a button finish or a lace-up back and is available in sizes 2-34. Picking out Accessories for your Vibe! After you’ve picked the perfect dress, it’s time to pick the perfect accessories to go with that dress! 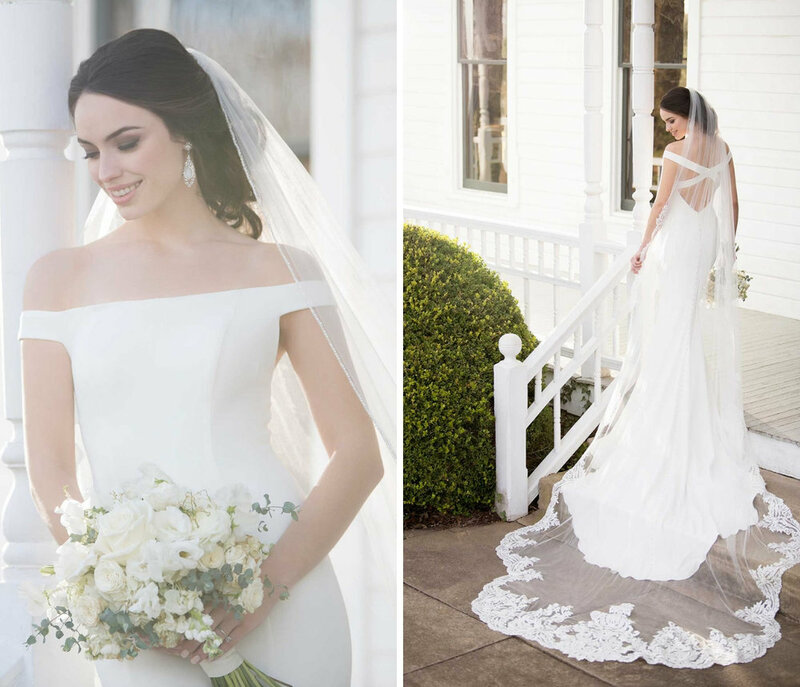 Whether you want a cathedral length veil, a modern over-skirt, fabulous headpiece or killer jewelry, picking out which accessories to wear to highlight the best parts of your dress can be a challenge. But not to worry! With our help, we’ll show you the best pairings for how to style your dream dress. PS. We love accessorizing! It is what makes each dress truly unique to each bride!! Veils are as synonymous with weddings as the dress itself! Veils add a touch of romance and tradition that no other accessories can bring. But with so many choices of lengths, styles, and adornments, the choice as to which veil to wear is endless! 3 Dimensional Floral Veil available in White or Ivory in any length. First up, 3D veils. One of our favorite veils is long and flowy and is embellished with hundreds of hand-cut 3D flowers. This veil is perfect if you want to highlight the floral lace design of your dress. You can wear it with any silhouette, really, because the 3D flowers fall gently down the length of the veil as if the bride has walked through a field of wildflowers and the foliage has been picked up by her dress. Another great option for the modern bride wanting to add a traditional veil to her look is a scalloped edged veil. Instead of just being cut in the traditional round shape, this veil is cut to mimic the scallop edged of the hand-cut lace trim that it is adorned with. What makes this veil even more special, is that it is lined with decadent bugle beads for added sparkle. One of the most important parts of your bridal look is your hairstyle, which will be defined by your headpiece. Headpieces, like all accessories complete the whole bridal vibe that you are going for. When choosing a headpiece for your big day, there’s no other way to do it but try them on to find the perfect one on you, this is not a task that should be done on line. Looks range from bohemian halos, romantic floral combs to a headband/belt with a art deco inspired motif, and so much more. You will definitely want to take your wedding theme into consideration as well. Important insider note: we find it best, when choosing your accessories to have your gown on, a little make-up and a your hair as close as you can get it to the style you would like to wear on your wedding day. This is the best way to truly evaluate all accessories. This is the best way to get the whole picture. It is hard to do that if you are not in your gown. I’ve rounded up a few gorgeous wedding headpieces for your viewing pleasure. All are available at Pure Bliss! Jewelry, quite surprisingly, seems to be an afterthought, rather than a priority, when it comes to planning a wedding. Big mistake! The right jewelry should show off your beautiful dress and make you feel fantastic, all day long. Bridal earrings don’t have to be only your grandmother’s pearls! Pick the style that suits you best. Saying thank you to your parents for taking part – financially, emotionally, physically – in your wedding is super important! While many brides-to-be gift their soon-to-be spouses a sentimental gift before the ceremony, many are also giving their parents gifts, too! Today, we’re talking about what to get the woman who raised you and gave you life, your mom! But what gift accurately expresses your gratitude to her for all her help planning your wedding? Keep it simple. Think about giving her something she can wear at the wedding, like jewelry. A lovely pair of stud earrings, maybe a simple gold bangle or even a nice watch are all acceptable gifts. Think about giving her something that she can keep for a long time and that marks the occasion. Getting mom a personalized handkerchief or a photo album of the two of you are both great ideas that will make her feel special. If you really want to say thank you, gift mom a weekend getaway to a spa retreat or a winery! Plan out the accommodations, travels, and events for her so she can relax after the big day. For more ideas and inspiration, check out our Insider Tips!